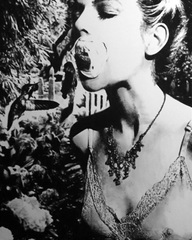 German enfant terrible Florian Heinke presents realist black paintings in first London solo exhibition 'ALLES WIRD GUT' at Shoreditch art gallery CHARLIE SMITH LONDON. "Once I got arrested and they put me into a programme in a workshop. They offered me an alternative punishment: to work in their painting studio. I did my first canvas there with brushes and colour. Graffiti was just the valve to show my rage, incomprehension and sadness." Heinke went on to study at Johannes Gutenberg Universität Mainz before untertaking his Masters at the renowned Städelschule. Since then he has gone on to become one of Germany's most vibrant young painters, exhibiting globally and being placed in prominent private collections, including that of Michael & Susan Hort in New York. 'ALLES WIRD GUT' – translated as 'Everything will be fine' – will present a typically Heinkian worldview. Smattered with irony, poetry, longing, derision, optimism and fury, the exhibition will embody Heinke's ongoing notion of 'Paradise Overdosed', traversing contemporary and modern politics; celebrity; glamour; greed; beauty and decay. Artist / Speaker: Florian Heinke.